The last update on EL's Health issues was posted ONE MONTH AGO, when I shared the results of her 2nd MRI. Finally, on Tuesday and Wednesday of this week, we were able to consult with three different specialists regarding the spots in her pituitary and pineal glands. This is a side view of the brain, with the front of the brain being on the left. 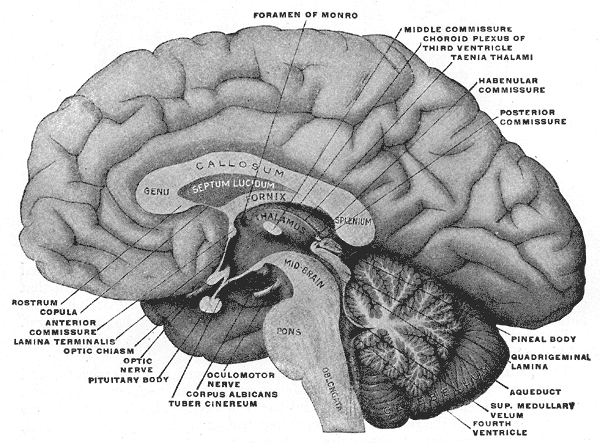 Click on this picture to enlarge it, and you will be able to read where the pineal and pituitary glands are located. THE OPHTHALMOLOGIST: At this appointment (also on Tuesday), EL was put through a thorough eye exam, including having drops put into her eyes to dilate the pupils. The exam was done to see if the enlarged pituitary was affecting her vision at all, or if the enlarged pituitary was causing any sort of damage to the optic nerve. (The pituitary is abutting up against the undersurface of the optic nerve.) It wasn't a fun experience for EL, but was necessary. Thankfully, the exam revealed that she has 20/20 vision and her optic nerve is in good shape! THE ENDOCRINOLOGIST: This was the final appointment, and probably the most important one. At this visit, the doctor examined EL, and talked with us about her symptoms. Currently, the doctor cannot give us a definite answer as to what is causing EL's pituitary enlargement. He ordered blood to be drawn to check her hormone levels and, once these results come back (along with the Tumor Marker levels), we will know more. CONCLUSION: The word "tumor" is a scary word. However, the doctors explained that a tumor just means there is an abnormal growth. It can be benign, or it can be malignant. The current indication is that, IF this is a tumor, it is most likely benign. So, if all of the blood levels turn out to be normal, then we won't need to be seen again for 3 months. At that time, they will do another MRI to see if the spots have enlarged or stayed the same. If, however, the blood levels are abnormal, then we will discuss what the next plan of action will be. As a parent with a medical issue, I have fought hard to get well for the sake of my family; but, even though going through treatments was a hard thing for me, it has been 10 times harder to watch my child going through numerous medical tests. Its one thing to suffer as an adult, but its entirely different to watch your child suffer, especially when she doesn't truly understand why she is being put through these tests. Through it all, we will hold tightly to the promise that the Lord is there to help us through this. Vicky I know the Lord will guide you every step of the way through this process. My prayer is that you know how close he is to your whole family as you walk through this. Thank you so much for letting us all know. We love your little one and everyone of you dearly. Praying and a phone call away. Thanks, Daneille. You all are dear to us, too. May God give you strength and courage to face each day and each situation. May you feel His arms around your family and see Him walking with you through every detail. Hugs. I'm so sorry to hear this news of uncertainty. I know how hard it is to wait for answers. I will definitely continue to keep you all in my prayers. Hopefully all you'll need to do is keep watching those spots. I agree, Sylvia. The waiting is hard but hopefully we will know more soon.